Encontrei 633 Hotéis em Pietrabruna. Escolha a data de entrada e saída para ver os hotéis disponíveis em Pietrabruna. Sem informar as datas, os preços com (*) são preços médios de cada hotel e nos arredores até uma distância de 10 km. Featuring free WiFi and a barbecue, Agriturismo via Gaudio offers pet-friendly accommodation in Pietrabruna, 35 km from Menton. The rooms are equipped with a flat-screen TV with satellite channels and DVD player. You will find a coffee machine in the room. Each room has a private bathroom. You can engage in various activities, such as cycling and hiking. The farm stay also offers free use of bicycles. Monte Carlo is 42 km from Agriturismo via Gaudio, while Sanremo is 13 km away. The nearest airport is Cuneo International Airport, 77 km from the property. Set in Boscomare, this holiday home features free WiFi and a terrace. The property is 34 km from Menton and boasts views of the mountain. There is a seating area and a kitchen complete with a dishwasher, an oven and a toaster. A flat-screen TV with satellite channels is provided. Other facilities at Casa Federica include a terrace. Monte Carlo is 42 km from Casa Federica, while Sanremo is 13 km away. The nearest airport is Cuneo International Airport, 78 km from the property. Set in Pietrabruna, Le Volte Di Pietra Antica offers a barbecue and sun terrace. Menton is 35 km from the property. Featuring a terrace, all units have a seating and dining area. All units include a kitchen equipped with an oven and toaster. Bed linen is featured. Monte Carlo is 42 km from LE VOLTE DI PIETRA ANTICA, while Sanremo is 13 km away. The nearest airport is Cuneo International Airport, 77 km from the property. Situated in Cipressa, this holiday home is set 36 km from Menton. The property features views of the sea and is 43 km from Monte Carlo. Free WiFi is provided throughout the property. The kitchen is equipped with a microwave and a toaster. A flat-screen TV with satellite channels is available. Sanremo is 13 km from Casa Vacanze Oliveto, while Alassio is 25 km away. The area is popular for cycling and hiking. Cuneo International Airport is 79 km from the property. San Rocco Apartment offers accommodation in Cipressa. The property is 36 km from Menton and free private parking is offered. The kitchen has a toaster. A TV is provided. There is a private bathroom with a shower. Monte Carlo is 43 km from San Rocco Apartment, while Sanremo is 13 km away. Levaldigi Airport is 79 km from the property. Casa Il Melograno offers pet-friendly accommodation in Castellaro. Guests benefit from terrace. Free private parking is available on site. There is a seating area, a dining area and a kitchen. Towels and bed linen are featured at Casa Il Melograno. There is a private bathroom with a bidet and shower. Menton is 32 km from Casa Il Melograno, while Monte Carlo is 39 km from the property. The nearest airport is Cuneo International Airport, 79 km from the property. La Rosetta is a holiday home with a terrace, set in Lingueglietta. The unit is 36 km from Menton. Other facilities at La Rosetta include a barbecue. Monte Carlo is 43 km from La Rosetta, while Sanremo is 14 km from the property. You can engage in various activities, such as cycling and hiking. The nearest airport is Cuneo International Airport, 80 km from the property. La Vela Verde offers pet-friendly accommodation in Lingueglietta, 36 km from Menton and 43 km from Monte Carlo. 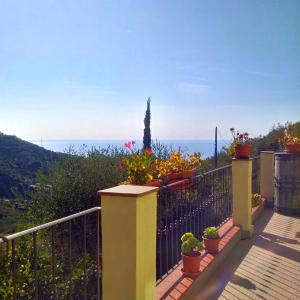 The property is 14 km from Sanremo and features views of the sea. Free WiFi is featured . The kitchenette is fitted with a dishwasher. Towels and bed linen are available in this self-catering accommodation. There is a private bathroom with a bidet and shower. Alassio is 25 km from La Vela Verde, while Ventimiglia is 28 km away. A number of activities are offered in the area, such as cycling and hiking. The nearest airport is Cuneo International Airport, 80 km from the property. Ti Vengo A Cercare offers accommodation in Castellaro, a 15-minute drive from Riva Ligure and 17 km from Sanremo. It features a garden and free WiFi. Rooms come with tiled floors and a vaulted ceiling. They offer garden views and a private bathroom with a hairdryer. Ti Vengo A Cercare serves a sweet Italian breakfast with hot drinks and orange juice. San Lorenzo Al Mare is 14 km from the B&B. Menton and the French border can be reached in 55 minutes by car.